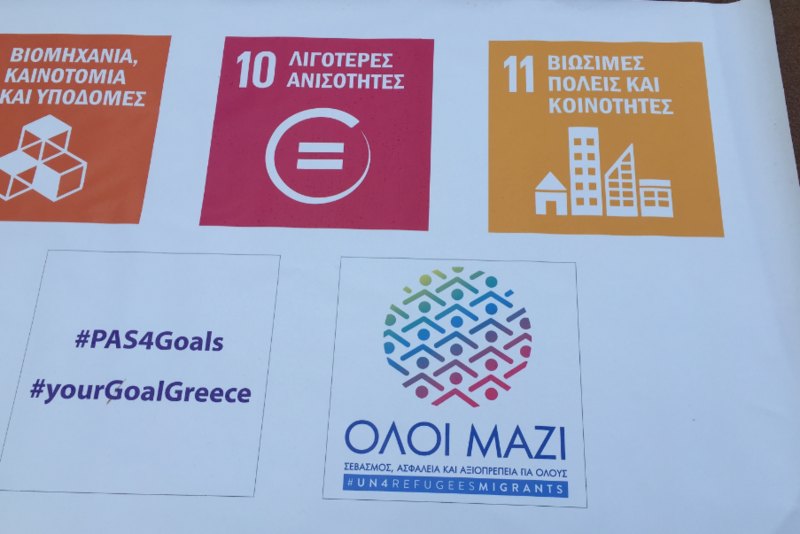 On Sunday, 30 April, Greek football Club PAS GIANNINA 1966 joined forces with the United Nations to raise awareness on the TOGETHER campaign and the 17 Sustainable Development Goals (SDGs). Rather, it was a game to celebrate our shared humanity, a festival of youth and sports for the promotion of our common goals: the TOGETHER campaign and the 17 Global Goals for Sustainable Development. Before the official start of the Greek Super League game between PAS GIANNINA FC of Ioannina and AEK FC of Athens, the two teams and the referees took to the field holding a big banner featuring the TOGETHER logo and the 17 SDGs. Whilst the TOGETHER logo and SDGs were unveiled on the pitch, the ground’s loudspeakers explained what they are about and how they could transform our world into a better place. The match ended in a draw 1-1. But regardless of the end result, when the referee signaled the end of the game, all attending had helped to score TOGETHER 17 Goals for a better world.